With the possible exception of Batman, The Monkees was probably the first show that I could ever say I was a fan of. 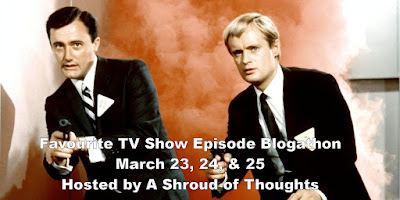 I don't remember watching it in its first run on NBC from 1966 to 1968 (no surprise given I was only three years old when it debuted), but in 1969 CBS began rerunning it on Saturday afternoon in the Central Time Zone (Saturday morning in the Eastern Time Zone). I watched every single episode and my parents could not get me to move from the TV set until The Monkees was over. What is more, my brother and I "inherited" our sister's Monkees albums, which we very nearly wore out by listening to them so often. The Monkees has remained one of my favourite shows ever since, and The Monkees are still one of my favourite bands. To this day, The Monkees remains my favourite sitcom of all time. Given how much I love The Monkees, it is very hard for me to choose one, single episode as my absolute favourite. That having been said, "The Devil and Peter Tork" would certainly number among my favourite episodes of The Monkees. Not only is it very funny, but after facing spies, gangsters, pirates, and even aliens, in this episode The Monkees face the Devil himself. As one might guess from the episode's title, "The Devil and Peter Tork" centres on Peter Tork. Peter wanders into S. Zero's Pawn Shop where he is taken with a harp. Unfortunately, Peter doesn't have any money and cannot afford to buy the harp, although he admits he would give anything for it. The shop's owner, one Mr. Zero (played by Monte Landis), gives Peter a contract to sign and tells him he can "play now and pay later." 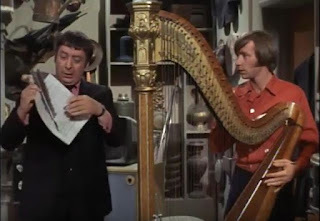 The other Monkees are not happy when Peter shows up at the pad with the harp, arguing it that it takes up too much space and that he cannot play the harp. It is then that Mr. Zero appears in a puff of brimstone and informs Peter and the other Monkees that Peter can play the harp. 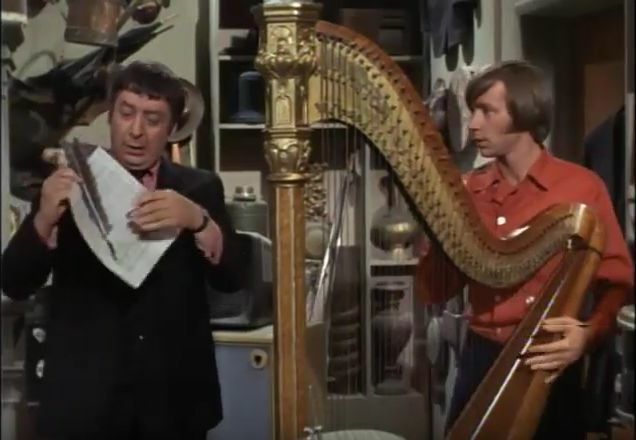 As it turns out Peter can play the harp and The Monkees become an overnight sensation when they incorporate the harp into their act. Unfortunately, The Monkees soon learn that Mr. Zero is none other than the Devil himself and Peter in signing the contract with Mr. Zero has literally sold his soul to the Devil. The Monkees must then figure out a way to get Peter out of the contract and save his soul. "The Devil and Peter Tork" was based on Stephen Vincent Benét's short story "The Devil and Daniel Webster", which in turn took its inspiration from Washington Irving's short story "The Devil and Tom Walker". Both owe a good deal to the German legend of Faust, a scholar and charlatan who sold his soul to the Devil in exchange for knowledge and power. "The Devil and Peter Tork" was actually the fifth episode completed for the second season of The Monkees, but it would be the 19th episode aired that season. There is an urban legend that NBC held the episode back due to objections over the song "Salesman", which some think is a veiled reference to a drug pusher. In truth this was not the case. Whether or not "Salesman" references a drug pusher (and I personally don't think it does), NBC had no objections to the song. Instead NBC's objections were to a scene in which The Monkees try to say the word "Hell", which is replaced by a "cuckoo" sound each time. The scene was probably made all the more objectionable to NBC's Broadcast Standards department because Micky Dolenz clearly mouths the word "Hell" in an exchange with Peter. Micky: "You know what is even more scary?" Micky: "You can't say (cuckoo sound) on television." Apparently Broadcast Standards objected to the word "Hell" even being mouthed on the air, not to mention they probably didn't appreciate The Monkees poking fun at them! "The Devil and Peter Tork" is significant as the very last episode of The Monkees in which a laugh track was used. The Monkees themselves objected to the use of a laugh track being used on the show, believing that the average viewer was intelligent enough to know when there was a joke or a gag taking place. This made The Monkees the only comedy airing on an American broadcast network at the time that did not use a laugh track besides Batman. Of course, this being The Monkees, "The Devil and Peter Tork" featured two songs. The first to appear in the episode was "Salesman", a song by Mike Nesmith's friend at the time Craig Smith. It was the lead track on The Monkees' latest album, Pisces, Aquarius, Capricorn & Jones Ltd. Appearing in the episode's tag was "No Time", which would be the last track from the group's album Headquarters to appear on the show. When "The Devil and Peter Tork" was rerun on CBS, "Salesman" was replaced by the song "I Never Thought It Peculiar", from the album Changes (by which time The Monkees consisted of only Davy Jones and Micky Dolenz). This was standard procedure for the show, from when it originally aired on NBC to its reruns on CBS and ABC. As The Monkees was meant in part to promote the band's latest songs, when an episode was rerun it was not unusual for the original song to replaced by one of the band's newer ones. For the show's release on DVD the original songs were restored to the episodes. The restored episodes are also now seen in syndication. After having won two Emmy Awards in its first season (for Outstanding Comedy Series and for Outstanding Directorial Achievement in a Comedy for James Frawley for the episode "Royal Flush"), in the show's second season "The Devil and Peter Tork" would be nominated for the Emmy for Outstanding Directorial Achievement in Comedy, again for James Frawley. It lost to the Get Smart episode "Maxwell Smart, Private Eye". "The Devil and Peter Tork" is not the funniest episode of The Monkees. It is also certainly not the most surrealistic episode either. That having been said, it is possibly the most touching. There is a certain poignancy to Peter's plight and his fellow Monkees' concern for him. And while Mike Nesmith always claimed he was not an actor, he gives what might be his best performance in the entire series in the final confrontation with Mr. Zero. James Frawley, who directed a staggering 28 episodes of The Monkees (more than any other director), also delivers some of his best work in "The Devil and Peter Tork". On "The Devil and Peter Tork" the show's production staff also has to be given credit for thumbing their noses at NBC's Broadcast Standards, perhaps the strictest in the business at the time. While it may not be the funniest Monkees episode or even the most far out episode, it is certainly one of the most enjoyable to watch. Earlier this year, on February 19, Mister Rogers' Neighborhood celebrated its 50th anniversary. Today would have been the 90th birthday of the man who both created and hosted the show, Fred Rogers. 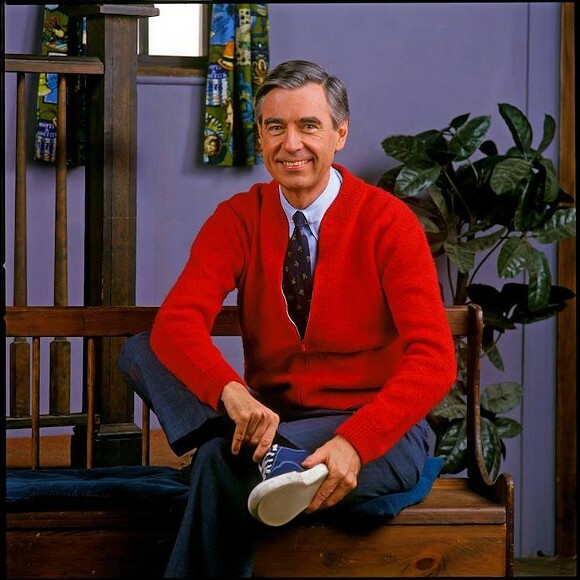 Mister Rogers' Neighborhood would prove to be the third longest running children's show in American television history (after Sesame Street and Captain Kangaroo). The show was founded on the premise that while children were different from adults, they were still human beings with their own thoughts and concerns. Furthermore, Mister Rogers believed that with a gentle, but firm approach children could be taught how to act properly. Fred Rogers was born on March 20 1928 in Latrobe, Pennsylvania. He earned a degree in Music Composition from Rollins College in Winter Park, Florida. He later graduated from Pittsburgh Theological Seminary and was ordained a minister in the United Presbyterian Church. It was after his parents got their first television set that Mister Rogers decided to go into television. Later on in an interview with CNN, he explained, "I went into television because I hated it so, and I thought there's some way of using this fabulous instrument to nurture those who would watch and listen." It was in 1951 that he got a job at NBC, working on such musical programmes as Your Hit Parade, The Kate Smith Hour, and The Voice of Firestone. He would later work on The Gabby Hayes Show. He quit NBC in 1954 and went to work for Pittsburgh public station WQED as a puppeteer on The Children's Hour. It was there that many of the puppets who would later appear on Mister Rogers' Neighborhood first appeared. It was in 1963 that he moved to Toronto, Ontario where the CBC hired him to develop and host a 15 minute children's show titled Misterogers. It not only marked the first time Fred Rogers was in front of the camera, but included many of the features that would later appear on Mister Rogers' Neighborhood, including the castle and the trolley. After four years he returned to WQED in Pittsburgh and took the show with him, renaming it Misterogers Neighborhood. The show aired through much of the East and ran for 100 episodes. It was cancelled due to a lack of funding. Fortunately, the Sears Roebuck Foundation decided to fund a revival of the show, giving it enough money to be aired nationally on National Educational Television (the predecessor to PBS). The new show, still titled Misterogers' Neighborhood, debuted on February 19 1968. It was in 1970 that it was renamed Mister Rogers' Neighborhood. Ultimately Mister Rogers' Neighborhood would run until August 31 2001, a total of 33 years. Through the years the show was nominated for several awards and won several as well. Its success was largely due to several factors, not the least of which was that Fred Rogers never talked down to his audience. In fact, the Fred Rogers on the show was pretty much Fred Rogers in real life. He once told Newsweek, "One of the greatest gifts you can give anybody is the gift of your honest self. I also believe that kids can spot a phony a mile away." Much of the show was devoted to educating children on how to handle their emotions, such as anger. He emphasised the importance of being nice to others. And while Mister Rogers was gentle in demeanour, he sometimes addressed serious issues of concern to children. Indeed, in November. 1983 he actually addressed an issue that most children's shows never addressed, that of nuclear war in a series of episodes entitled "Conflict". "Conflict" was not the only time Mister Rogers addressed a serious issue on the show. Early in the show's run, he discussed death when one of his goldfish died. Of course, Mister Rogers did not simply discuss feelings and issues of concern to children. He also gave children an inside look at various professions. In the show's long run, Mister Rogers visited a dairy farm, the headquarters of the United States Postal Service, and various other workplaces. 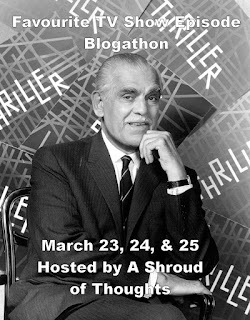 Over the years he featured such guests as Tony Bennet, Julia Child, David Copperfield, Marcel Marceau, Rita Moreno, and even fellow children's show host Bob Keeshan (forever remembered as Captain Kangaroo). One important aspect of Mister Rogers' Neighborhood, although it was not often discussed, is that it was both multi-ethnic and multi-racial. Early in the show's run an African American teacher named Mrs. Carol Saunders appeared regularly. It was a bit later that an African American police officer, Officer Clemmons, appeared as a regular. Over the years characters and children belonging to a number of ethnicities appeared on the show. In a decade of race riots, when racism still occurred all too often, Mister Rogers' neighbourhood was one where everyone, regardless of their ethnicity, got along. Fred Rogers's activism went beyond his television show. In 1969, only around two years after the Corporation for Public Broadcasting had been launched and about a year before PBS would be founded, there was a real danger that funding to public television would be severely cut. Fred Rogers appeared before the United States Senate Subcommittee on Communications and eloquently spoke of the need for public television. Senator John O. Pastore, who had never been particularly friendly towards the television industry, told Mister Rogers, , "I think it's wonderful. Looks like you just earned the $20 million." For 1971, funding for public television was increased $9 million to $22 million. Fred Rogers would also play a pivotal role in insuring the average person could record TV programmes on VCRs. With the introduction of the VCR in the Seventies there also arose controversy. The motion picture industry maintained that such technology constituted copyright infringement, and in 1976 Universal and Walt Disney sued Sony to halt the sale of their Betamax recorders. A U. S. District court ruled in Sony's favour, but in 1981 Universal filed an appeal. Fred Rogers came to Sony's defence in the case known as Universal Studios vs. Sony Corporation of America, which reached the Supreme Court in 1983. Mister Rogers stated, "Some public stations, as well as commercial stations, program the Neighborhood at hours when some children cannot use it ... I have always felt that with the advent of all of this new technology that allows people to tape the Neighborhood off-the-air, and I'm speaking for the Neighborhood because that's what I produce, that they then become much more active in the programming of their family's television life. Very frankly, I am opposed to people being programmed by others. My whole approach in broadcasting has always been "You are an important person just the way you are. You can make healthy decisions. Maybe I'm going on too long, but I just feel that anything that allows a person to be more active in the control of his or her life, in a healthy way, is important." The Supreme Court ruled in Sony's favour, and cited Fred Rogers's comments in their decision. If Fred Rogers is still so very respected, it is perhaps because he emphasised on his show and even lived his life according to the simple philosophy that all human beings have worth and that everyone should be accepted for who they are without condition. In the book The World According to Mister Rogers: Important Things to Remember, Fred Rogers is quoted as saying, "Mutual caring relationships require kindness and patience, tolerance, optimism, joy in the other's achievements, confidence in oneself, and the ability to give without undue thought of gain." Now more than ever, we have need of the kindness, patience, and tolerance that Mister Rogers taught on his show. 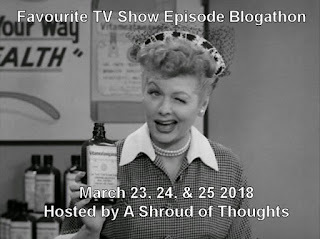 This is just a reminder that the 4th Annual Favourite TV Show Episode Blogathon begins this Thursday! If you want to participate, it's not too late. Just visit the original post here.